Neil Degrasse Tyson is one of America's best known and most loved scientists, for very good reasons. I'm always blown away at what a great science communicator he is. 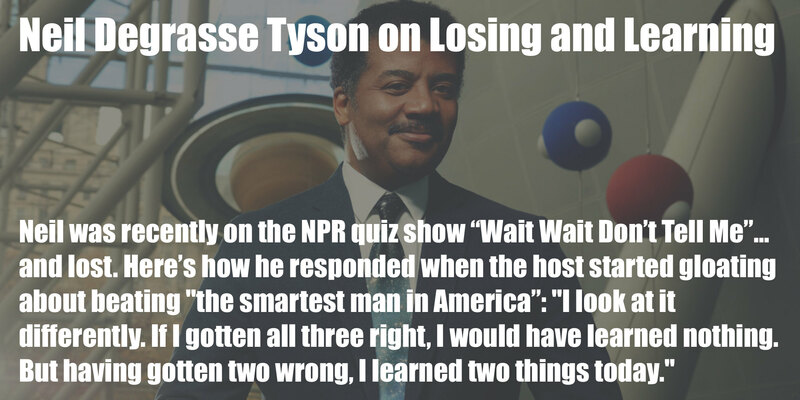 Here's Degrasse Typson just killing his appearance on the popular NPR quiz show "Wait Wait Don't Tell Me". Listen to it, and then scroll down for the best part, in my book. So many hilarious and quotable parts of this segment. But the best part is right at the end, when Neil is told that he lost the quiz. TYSON: …I would've learned nothing. But having gotten two wrong, I learned two things today. I'm going to be using that very soon when talking to my teens about the value of failing. Previous ArticleSF MOMA to be the Largest Modern Art Museum in the Country!